University of Notre Dame, B.S.M.E. 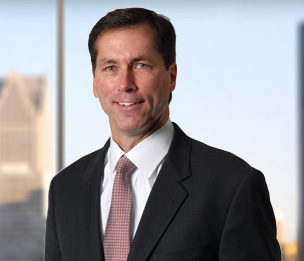 Michael P. Cooney is the Director of Dykema’s Litigation Department. A highly experienced trial attorney, his national trial practice is focused on product liability, class action, patent, and commercial litigation. He is regularly called upon by Fortune 500 companies to try high exposure cases in the country’s toughest venues and against some of the country’s top trial attorneys. Mr. Cooney, who has a mechanical engineering degree, has extensive experience presenting complex engineering, business, and science related disputes to juries, judges, and arbitration panels. Mr. Cooney has tried numerous cases to verdict throughout the U.S. He serves as national and regional trial counsel for automotive manufacturers and suppliers on a variety of commercial and intellectual property disputes. He has defended class action, intellectual property, and product liability cases involving a wide variety of commercial and consumer products and technology, including motors vehicles, medical devices, recreational vehicles, water craft, industrial equipment, home appliances, lift trucks, and power tools. Mr. Cooney also serves as national and regional coordinating counsel for litigation matters, managing the overall defense of claims, developing defense strategies, streamlining discovery, and preparing and presenting company witnesses and experts. He counsels product designers, manufacturers, and sellers on safety, regulatory, trade secret, and intellectual property matters, including NHTSA and CPSC investigations and disputes. He also provides product liability avoidance advice, including design reviews, product warnings, and user manuals. Mr. Cooney is highly regarded in the area of automotive crashworthiness litigation, safety technology and safety regulation. He is well-known for his technical expertise, particularly in the areas of occupant restraints, fuel systems, vehicle handling and stability, hybrid power trains, telematic systems, driver distraction, and connected vehicles. Mr. Cooney is recognized for his knowledge of legal and regulatory issues related to hybrid and electric vehicle technology. Kline v General Motors Corporation, St. Louis City, Missouri, Case No. 042-09579. Defense verdict following 4 week trial of allegations that fuel system design defect caused a post-collision fire and burn death of the 16 year old occupant of a GM sport utility vehicle; upheld on appeal, Missouri Court of Appeals, Case No. ED 89839, Missouri Supreme Court Case No. 08-4593. Sobczak v General Motors Corporation, Cook County, Illinois, Case No. 00 L 4917, defense verdict after three week trial on claims that engine fuel management and exhaust system design defects caused automobile fire and permanent, disfiguring burn injuries. Morris v OnStar, et al, USDC, Eastern District of Michigan, MDL 1867. Defeat of a putative national class action alleging the plaintiffs’ alleged loss of telematics services as the result of the transition by cellular service provides from analog to digital services. Verry v General Motors Corporation, Eastern District of California, Case No. 2:06-CV-01566-LKK-EFB, successful resolution of highly visible litigation involving the outside frame design of GM's C/K pickup; Mr. Cooney serves as GM's national counsel in the defense of all claims arising out of the C/K pickup fuel system. Wheeler, et al. v Rheem Manufacturing, et al., Wayne County, Michigan, Case No. 99-906781 NO. Defeat of class certification for water heater defendants in putative class action challenging alleged component part failure.